Pull the green release cord beneath the rear tray to the right. 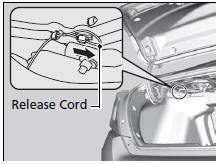 ► The release cord unlocks the fuel fill door when it is pulled. After taking these steps, contact a dealer to have your vehicle checked.